For more information and tickets, go to Rocklahoma.com! A committee in the Oklahoma House of Representatives shot down a proposal to allow for open-carry in the state of Oklahoma. The vote was 9-8. The House Public Safety committee Wednesday voted 9-8 against the measure by Rep. Leslie Osborn. It's identical to a bill approved by the Legislature last year but vetoed by former Gov. Brad Henry. The bill had passed the Senate and would have allowed anyone 18 or older to openly carry a firearm without a license. The committee struck those provisions with an amendment requiring those who openly carry handguns to have a concealed carry permit that requires criminal background checks. Not a fan of open-carry myself, however, there is a possibility that voters will get to decide if Oklahomans with their SDA license will be able to openly carry firearms. Glenn Beck...you either love him or hate him and his daily program on the Fox News Channel is going away this fall, according to reports. 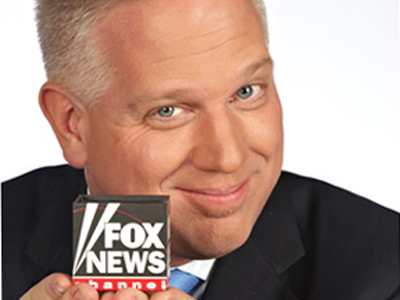 Beck is a staple of the talk radio diet, hosting the third-largest syndicated talk show in the nation. Beck is heard locally on Clear Channel's News Radio 1000, KTOK. “It’s not subsidizing the show at all,” Murdoch fired back, adding that the theatrical Beck gives “a terrific kickoff” to the Fox News evening lineup. Rumors have abounded regarding Beck's daytime Fox News television program and the consternation and hand-wringing from advertisers appear to have gotten the best of Beck. Oil prices continue to soar and along with it, the price of gasoline in the great state of Oklahoma spikes as well. 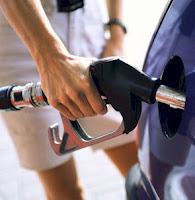 Today, your humble Gorilla spent $3.57/gallon to fill up and all indications are that there will be no relief in sight. Previous administrations took seriously the impact of transportation fuel on the economy, but once again, this administration seems to have little concern or is even apathetic about it. Perhaps the fears of a looming government shut-down in Washington has distracted the President. Oil peaked today at $123/bbl, the greatest Brent price seen since 2008. The ECB is expected to raise interest rates by 0.25 percent on Thursday in the first hike since the 2008 financial crisis. The expectations have propelled the euro to a 14-month high while the dollar index (^DXY - News) was down 0.34 percent at 1450 GMT. "Central bankers will always claim that they have no influence on oil prices but recent history has repetitively shown that in the new world, where commodities are a global asset, central bankers can have a greater influence on oil prices than OPEC," said Olivier Jakob from Petromatrix. Are you following along? Call your Congressman today and if they aren't out of the office on a vacation, ask them to wake the hell up and get the speculators under control. The poster is in the "design" phase - you see it first! We hosted fundraising music jams for the HUGS Project and for the Mid-America Chapter of the Paralyzed Veterans of America. 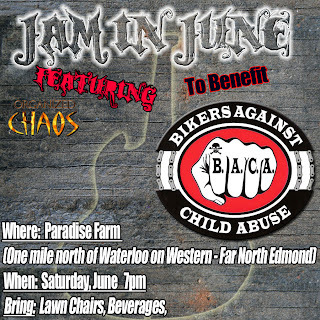 Now, we're going to be hosting a Music Jam for another incredible group of people - Bikers Against Child Abuse (BACA). BACA is non-profit organization, with an internationally broadcast radio show entitled "BACA Nation" and it is produced right here in Central Oklahoma. BACA reaches out to children who are in abusive homes or have been abused and creates sort of a buffer and they act as a reminder to abusers that yes, there is someone who cares and will look after these kids. BACA is one of a kind and their efforts are to be lauded. 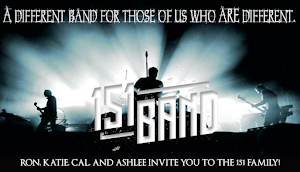 Which is why we're going to do a fundraiser music jam for them in the month of June. 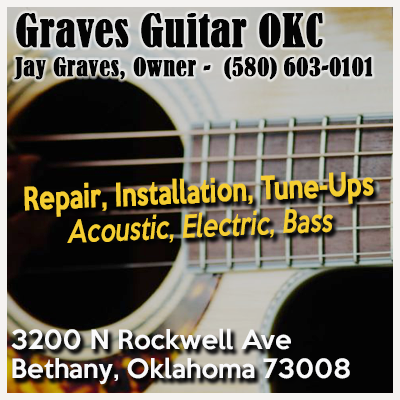 The date hasn't been set yet, but it will be a Saturday evening in the month of June and there will be other musicians and bands represented there and bringing their friends as well. Of course, we will have representatives from BACA onboard to educate attendees about their organization and how our contributions can help them accomplish their goals in Central Oklahoma. More details will be following! 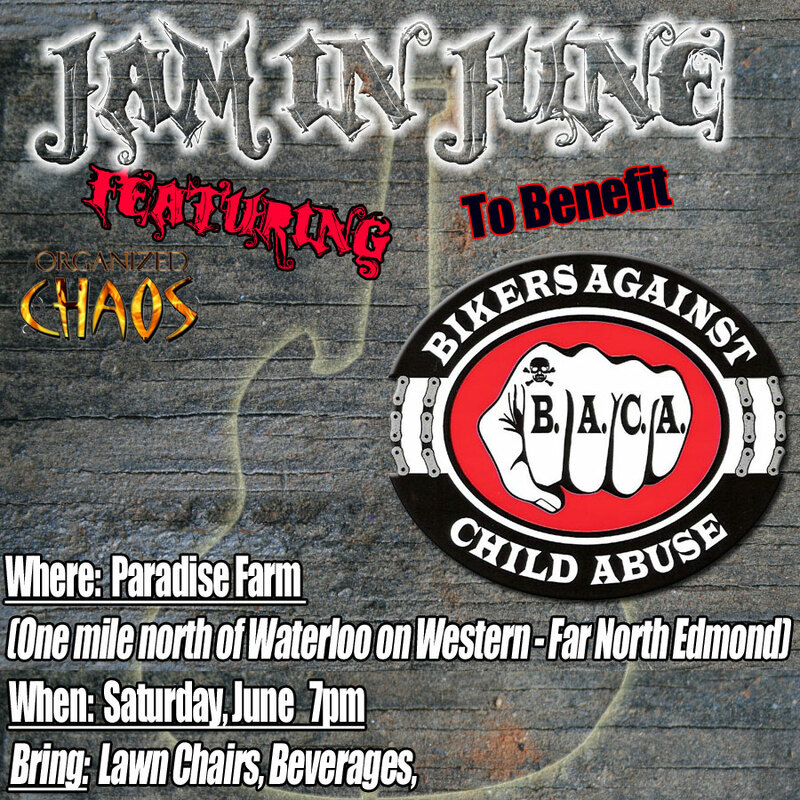 The band in which the Gorilla plays, "Organized Chaos," is hosting the event and will open the show for other bands and musicians who want to raise awareness for BACA. 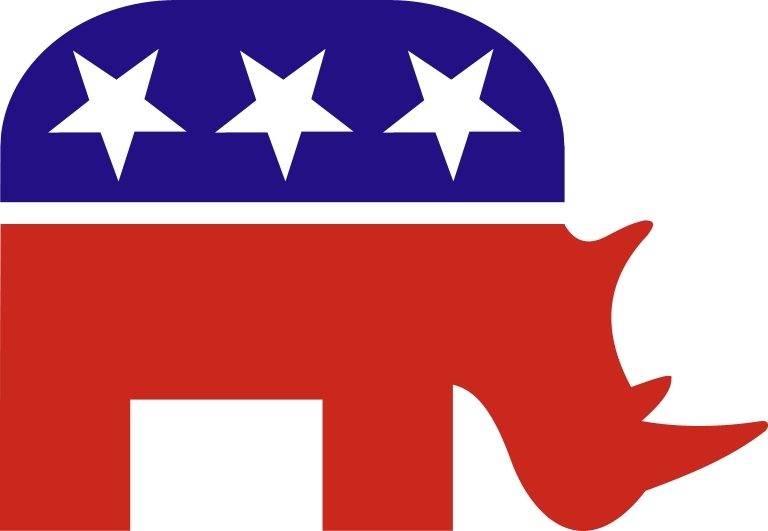 RINO: Republican In Name Only. It seems that the term has been misused of late, wherein some of the more moderate Republicans who don't consider OCPAC to be equal to that of the Council of Chalcedon are labeled. There are, mind you, some legitimate uses of the term and there are most assuredly a few stumbling about down under the methane gas filled dome. But at the end of the day, we must use caution in our labels for many who are labeled as such are clearly not. I have heard Randy Brogdon labeled as a RINO because of his acceptance of a state job after campaigning so hard against growth in government. The latest is that of Representative George Faught (here). This, I find exceptionally amusing. Faught is many things, but two-faced is not one of them nor is he a RINO. City Council Cash: The Oklahoma City Council races have turned into a profit center for consultants and mailing houses, but the average Joe seems less than impressed. The Oklahoman put together quite the story on the money pouring into the mess and frankly, it is an indicator of just what direction the City of Oklahoma City is headed. Oklahoma City does appear to be headed in the right direction, yet the construction has become troublesome and getting around downtown is increasingly difficult. The finals are tomorrow, and the more moderate of the candidates (Ed Shadid) will face a tough opponent. As always, it will come down to which of the candidates have a game plan to get voters to the polls. We Are One Rally: Today, union members and union supporters gathered on the steps of the capitol and the turn out was pretty good all things considered. Not as many as the Tea Party Rallies, but still, a very good showing. The aggregate result is still left to be seen.